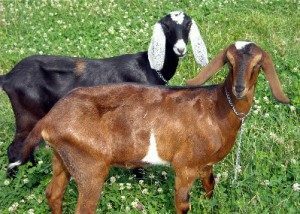 You've found the “Indiana Nubian Goat Breeders” page here at Hobby Farm Wisdom! If this is the first time you have visited our site: Welcome! The Anglo-Nubian, or simply Nubian in the United States, was developed in Great Britain. They have large, pendulous ears and a “Roman” nose that that distinguishes the breed. The udder of the Anglo-Nubian is voluminous but is sometimes more pendulous than that of the Swiss breeds. Nubians are a relatively large, proud, and graceful dairy goat, the does weigh at least 135 pounds and the bucks 175 pounds. The height of the breed measured at the withers is 30 inches for does and 35 inches for bucks. Black, red or tan are the most common colors. The Nubian’s size makes it a very useful dual purpose animal. They lead the way for the dairy breeds in butterfat producing an average of 5% or more butterfat content. Can’t find the right Nubian Goat in Indiana? Check in: Illinois, Michigan, Ohio, Kentucky, or Wisconsin. Or, to see a list of ALL the Nubian Goat breeders in the US: Click Here!